Some of the instruments, especially ‘multi’ instruments, within the Berlin Series by Orchestral Tools have a very high RAM footprint. This is in part due to the number of samples available for things like legato and shorts round robins. It is also affected by the number of microphones loaded. However, there are elements of the multi patches that can be influenced by the user to reduce Object Memory and TM Pro Voice memory. This article explains what these things are and how to reduce them where desired. This can be as much as 305Mb for a Berlin Brass multi patch. While Orchestral Tools and Kontakt both optimise this highly, in terms of graphics referenced in multiple patches and the like, this can still stack up substantially. When using Berlin Brass and Berlin Woodwinds Legacy, I generally only use the Close 1 and Tree or Mix from each library. It occurred to me that there was some extra data in the instrument for microphone positions that, while the samples are not loaded, the mapping is still required in case the user wanted to load them and that this could have a cost. In fact it does. 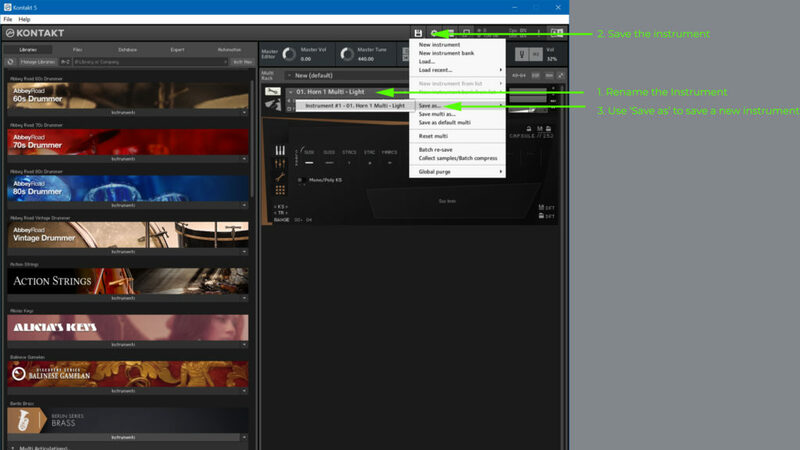 The Kontakt Scripts cannot be edited, due to the scripts being locked. This is understandable as the technology here could be reverse engineered by other developers. 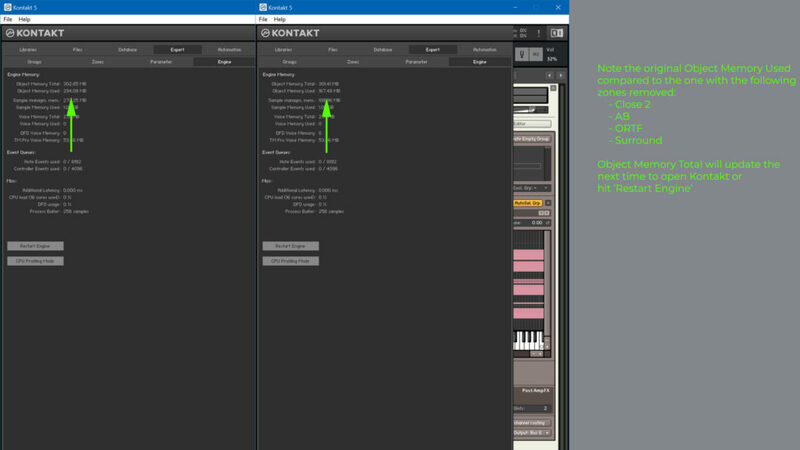 The Kontakt Parameters are also linked into this. Orchestral Tools very thoughtfully did not lock the instrument itself. One can observe that there are very few Group Effects, Instrument Effects or Bus Effects and removing them has a negligible effect (~.5Mb) effect on the Object Memory of the instrument. 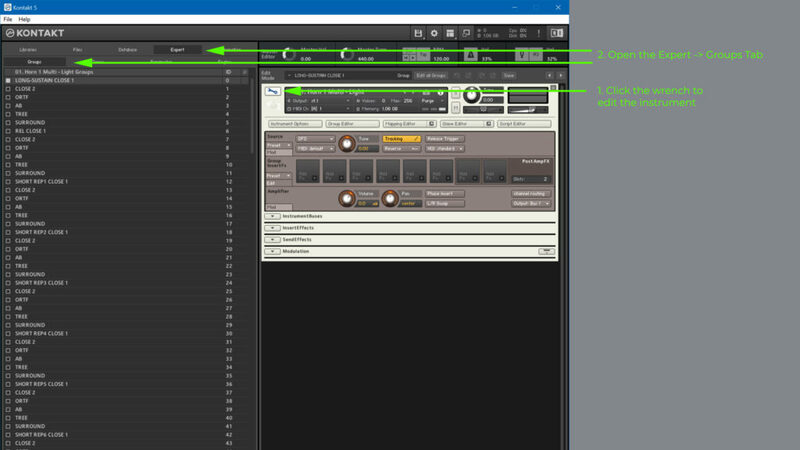 I attempted to remove the Kontakt Groups, since Orchestral Tools has thoughtfully named and arranged the groups used by microphone position. In deleting what I typically don’t use for the Horn 1 multi patch in Berlin Brass (groups from Close 2, AB, Surround and ORTF), I found that the instrument started to play weird releases and samples. This is not surprising, as each group has an ID associated. It is likely that the script looks for these IDs and therefore plays different samples when they are removed. I noted that I could still remove the zones from these groups without removing the groups themselves. This resulted in a substantial reduction in Object Memory (almost half) with no discernable effects to the sound or functionality of the instrument, besides being unable to use the microphone positions I removed zones for. 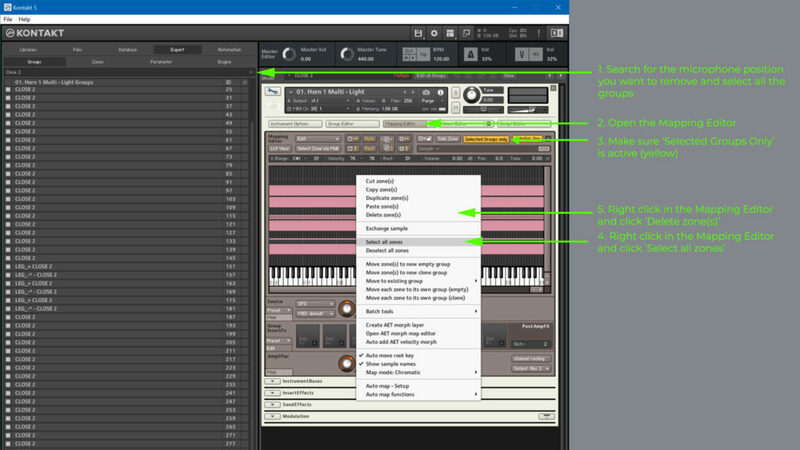 Because Orchestral Tools have organised their groups by microphone position, it is in fact very easy to remove zones mapped to those groups by editing the instrument. Below are instructions on how to do this, but it is extremely important that you save the patch as a new patch before making changes and keeping a backup of your patches. Memory allocated to TimeMachine is generally quite high depending on whether you have the repetitions articulations (16ths, Triplets) loaded, especially in a Multi patch. The Multi patches, if these articulations have not ever been loaded, are already efficient in this regard. However, if one loads one of these repetitions articulations, then removes it, not all values are cleaned up. Adjusting these Voice Limits will have substantial impacts on the Object Memory and TM Pro Voice memory of the Multi patch. The values specified feel appropriate for using multiple microphone positions as well as chords. However, if you use these articulations as a single voice or only two microphone positions you might not need the Voice Limits as high as they are. Additionally, if you have loaded one of these articulations and since removed it, the patch may still retain its original voice limits. This is likely a bug within the patches themselves.